Image caption TfL warned minicabs in bus lanes could "seriously disrupt the bus network"
A minicab company has asked its drivers to drive in the bus lanes in London, so ignoring the restrictions. Addison Lee's chairman said allowing only licensed black taxis to use the lanes was "unfair discrimination". John Griffin said the firm would "indemnify any fines or payments" that the firm's 3,500 drivers incur. Transport for London (TfL) surface transport director Leon Daniels said: "The letter from the management of Addison Lee is utterly irresponsible." Mr Griffin said: "The current bus lane legislation is anti-competitive and unfairly discriminates against the millions of passengers that use Addison Lee. "Minicabs perform the same function as black taxis and are licensed by the same authority, so there is no reason that they should be penalised due to outdated legislation. "Black taxis are not a public service, they are a business just like minicabs." But TfL's Mr Daniels in response said: "By issuing (the letter), Addison Lee risk regulatory action against themselves and leave their staff liable to criminal prosecution." He added TfL had asked Addison Lee to withdraw its letter "immediately". "We are also writing to all Addison Lee drivers reminding them that repeated breaches of traffic regulations could see their licence to operate withdrawn," he added. "Allowing tens of thousands of private hire vehicles to drive in bus lanes would seriously disrupt the bus network and our passengers' ability to get around the capital." The minicab firm claims that the ban also breaches EU regulations relating to the freedom of establishment and freedom of supply services. 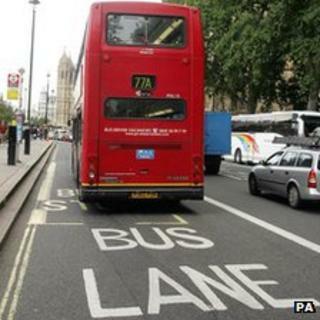 The company said it had secured a judicial review on the issue of the use of bus lanes and instructed its drivers to use the marked lanes until the case is heard later this year. The firm has also asked its drivers to make a note if there is any dispute with any black cabs over their use of the lane.